The carbon industry has come a long way in its manufacturing process and understanding of how carbon works. US manufacturing got a big start from military funding when, during WW II, Japan cut off the supply of coconut-shell based activated carbon (AC) that was used to protect US troops with gas-mask carbon units against toxic gas used by Germany. When the war ended, the first major GAC application was drinking water. This application has grown and is still growing. Activated carbon is the most widely applied filtration media in the world; it’s vital to air and water treatment. Estimated world consumption of AC is 1.7 million tons per annum, with a growth rate of 10 percent per annum. When carbon adsorbers are monitored and serviced regularly, a barrier is created that provides safe, high- quality potable water. Granular has an advantage over powdered in that the used AC can be reactivated many times; powdered is a one- time-use material. Granular is used in columns or beds to provide continuous processing and powdered provides a batch process. Granular can reduce the contaminant level to non-detected, whereas the powdered batch process provides equilibrium, and some contaminant remains in finished water. Granular has five times more capacity and is more efficient than powdered. Columns and hardware are not needed to do backwashing to maintain head pressure using powdered. Powdered is dosed into clarifier process water and contact and sedimentation time is allowed to separate used powdered carbon from sludge. If there are only periodic summertime taste and odor issues, having powdered on hand for the clarifier process may be the best option. A few simple, lab-sized bottle tests can determine the powdered AC dosage. Carbon is like an insurance policy; it is ready for a process upset. ASTM values for particle size distribution (mean particle size diameter, uniformity coefficient and effective size) are important specifications. ASTM provides major test methods to evaluate AC life-cycle stages (1). Software programs, which increase productivity of ASTM testing, are available to analyze granular mm sizes and powdered micron sizes, and estimate the amount of AC needed for specific applications (2). Activated carbon works in different ways: physical filter, physical adsorption, active reagent, catalyst, absorption and targeted chemical adsorption when AC is impregnated with specific chemicals. 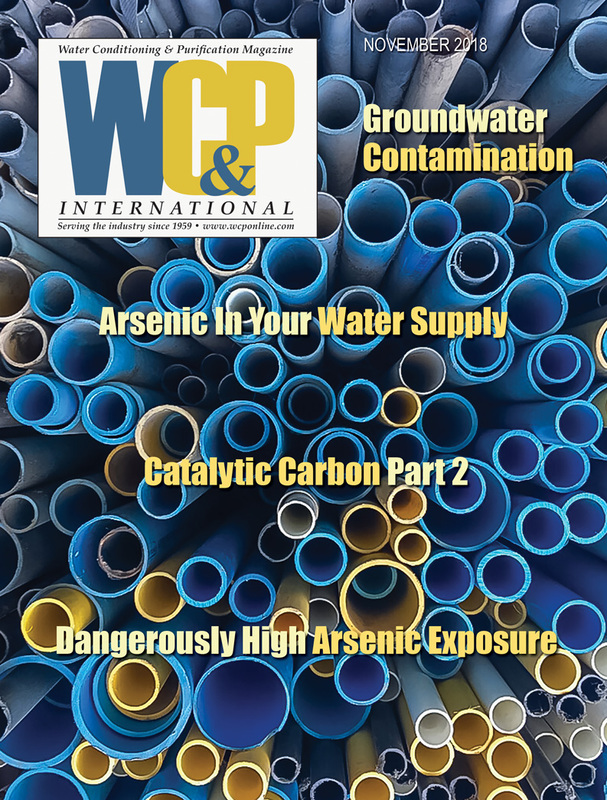 The physical adsorption phenomenon is most important for drinking water applications. Molecular adsorptive properties of AC result from interaction of attractive forces that exist between atoms making up the walls of nanopores (or adsorption spaces) and water-soluble contaminant molecules at the atomic level. Its large adsorptive capacity results from complex, three-dimensionally contoured, interconnected porous networks in AC grains. Activated carbon internal surface area and pore volume are several times the external surface area and volume of grains themselves. Commercial AC possesses high internal surface area (around 1,000 m2 per gram) with large internal pore volume of between 0.3 to three mL per gram. Porosity within adsorbents has been categorized by IUPAC based on width of pores.3 The largest pores or adsorption spaces, called macropores (access pores), are 100 to 50 nm wide; intermediate pores, called mesopores are 50 to 2 nm wide. The smallest pores (< 2 nm) are called micropores (adsorption pores) and have the highest adsorption energy (AE) per volume. Their local interconnection and distribution are illustrated in Figure 1. Macropores are determined by varying the mercury pressure of bathing AC grains in liquid mercury to obtain liquid intrusion, or liquid outside to inside. Mercury does not infuse into AC; it needs pressure to infuse into macropores. Pressure needed to force mercury into micropores is beyond practical instrumentation. Correlations between macorpore sizes and pressures to cause intrusion are used to map macropore sizes. Microporosity is determined by low pressure and temperature nitrogen isotherms. Commercial AC is approximately 90-percent carbon. The size of the graphitic plates and spacing between platelets depends on the feedstock and process parameters dur- ing manufacture. Coconut shell provides the largest and tightest graphitic platelets, closely followed by bituminous coal-based AC; wood-based AC has the smallest platelets with more open space between platelets, thus the lower apparent density and mechanical strength. Figure 2 provides a schematic representation of regional interconnective and spacing distribution of graphitic platelets in coconut-shell finished AC. Greenbank’s model has simplified AC porosity into transport and adsorption pores. Customers quickly note color, taste and odor of their drink- ing water. Activated carbon is well known to improve these characteristics. Color can be due to organics, such as tannic acid from degradation of biomass, or inorganics, such as high concentrations of ferric iron. Activated carbon removes organics very well and only marginally if inorganic. Ion exchange (IEx) can be used to remove inorganics. Activated carbon is used to protect IEx against oxidation and organic fouling; put low-cost AC in front of expensive IEx media. Chlorine taste and odor in drinking water is positive evidence of protection against microorganisms, but its taste and odor should be removed before drinking or cooking. Carbons do this very well with a small carbon-based final filter in domestic applications. Activated carbon is a reducing agent slightly less powerful than copper metal. Drinking water hypochlorous acid is converted to tasteless chloride ions by carbon. This is a chemical reaction that consumes the carbon. Since hypochlorous acid concentration is low, carbon degradation is unnoticeable, as it is flushed out of the adsorber. (Putting a half-teaspoon of GAC granules into a beaker, then adding bleach will show the degradation; i.e., granules are liquefied quickly.) Potable water-plant GAC beds dechlorinate influent water, but they can be subsequently rechlorinated before water is dispensed to customers. Another example of carbon as a reducing agent is its use with ozone. Ozone is an effective pretreatment to make carbon last longer. Ozone converts large molecules in water to small fragments that microorganisms can mineralize to carbon dioxide and water. The excess ozone, which has a sweet smell, is converted to oxygen by activated carbon, another example of an oxidation- reduction chemical reaction. All of these reactions give off heat. In water, heat is dissipated, but in the vapor state, explosions are possible. Exothermic heat needs to be managed with sufficient flow or cooling. If an oxidant that exists in water or air is to be removed, AC should be considered; however, this involves exothermic reactions*. The largest safety issue with activated carbon is a closed container, since AC adsorbs oxygen and can lead to asphyxiation. Activated carbon granules can concentrate 1-atmosphere-pressure air to 7-8 atm in the AC micropores. The Occupational Safety and Health Administration (OSHA) has specific rules and regulations for entering low-oxygen environments, such as AC in closed vessels. Overall, though, carbon is a very safe material. Particle size is very important for water plants and small home units that use carbon. Smaller is better, but too small can inhibit gravity water flow through process adsorbers. Smaller particles provide more outer surface relative to inner particle volume. Thus, molecules can diffuse more quickly to the par- ticle center to obtain complete particle utilization. Diffusion is the slowest step in organic contaminant physical adsorption by activated carbons. It takes time to get adsorbates to fast activating micropore active sites. It is important to have a proper distribution of GAC particles to maintain water flow through adsorbers. Historically, GAC replaced sand filters; today, sand is often applied as a GAC filter underdrain. Sand or other underdrain materials also need to be tested and replaced periodically. Like carbon, they do not last forever. When municipal water treatment plants are operating, they need small particles at the top of the bed and large particles on bottom. Small particles fit together tighter and have a smaller direct flow through a cross-section. These small gaps create an effective filter to remove debris from influent water. This debris builds up a filter cake, which can be backwashed and removed. Typically filter backwashing is done automatically. When the GAC filter head pressure reaches control limits, the filter is back- washed to remove the cake and restore normal head pressure. Backwashing means reversing the flow through the GAC bed. This increases AC working bed height and loosens the collected filter cake; it is carried away by a drain line to a suitable drain. Do not put it back into the influent water adsorber. It is very important to drain the backwashed water slowly to get all of the particles back to the original strata, small on top and big on bottom. Before new carbon is put into service, backwashing is done to remove dust and undersized particles and fragments and get the proper particle-size distribution. It is important to maintain the particle-size distribution with multiple life-cycle backwashing events. A particle with contaminants on board is in equilibrium with the liquid phase. If a small, dirty particle is moved to the bottom of the bed, it is now bathed in clean water, where some on-board contaminants will be released into the effluent (finished water). This happens when the backwashed bed settles too fast. Municipal GAC beds are typically three to 10 feet deep. In small-home AC units, particles are tightly packed, so their posi- tion in the bed does not change with time. Municipal beds are often configured to provide multiple beds together, effectively increasing the total height of the carbon bed. Having the correct GAC amount of barrier between influent and effluent is impor- tant. Higher risk of pollution episodes need deeper GAC contac- tors to protect consumers. In water plants, GAC typically lasts three to five years. Drinking water spent GAC can be furnace- reactivated at about half the cost of virgin or unused GAC. The reactivation process is similar to activation. The carbon bed sets up a mass transfer zone (MTZ). Typically, the goal is to maintain the MTZs in the bed for target or regulated contaminants, though all compounds in water do not need to be removed. Real operations have multiple MTZ for different compounds; the size and shape of the MTZ depends on many things, such as GAC particle size, particle activity, flowrate, contact time, temperature, presence of competing adsorbates, etc. A smaller particle or slower flowrate results in a more favorable and smaller MTZ. Decreasing size and shape of the MTZ provides better carbon utilization in gallons treated per pound of activated carbon. Thus, the carbon lasts longer with better process parameters. Jersey City, NJ was the first large US city to continuously use calcium hypochlorite in 1906. Prior to chlorination, death rates due to typhoid fever were 80 per 100,000. After chlorination, these rates decreased, and by 1936, typhoid fever in the US was eradicated due to all major cities using chlorine disinfection. Chlorine is very reactive as an oxidizing and halogenating agent; several hundred individual chlorination DBPs have been identified. They are easily detected so we tend to focus on them. Chlorine oxidizes microorganisms’ cell walls and/or DNA of viruses, bacteria and protozoa. Cryptosporidium protozoa, however, are resistant to chlorine, but not to chlorine dioxide. A simple pass of chlorinated water through almost any activated carbon eliminates chlorine taste and odor. This ability will outlast organic adsorption. In the last few years, chloramine has been replacing or complementing chlorine. It is made at water plants by adding ammonia to hypochlorite. Chloramine is less reactive than chlorine and a lesser disinfectant. It is being used as a secondary disinfectant in distribution and storage because it lasts longer. Monochloramine is very effective for Legionella control in plumb- ing; because of its persistence and being very hydrophobic, it penetrates biofilms. Activated carbon is an important contributor to high-quality drinking water. While carbon installation in a large city adds cents per day to the water bill, it is a very cost-effective treatment strategy. Many drinking water plants constructed 10 to 40 years ago should consider upgrading their process by adding activated carbon adsorbers. This would help to reduce customer complaints, improve drinking water quality and be cost effective. Classical activated carbons that remove chlorine do not react with chloramines. Catalytic carbons have been developed to remove chloramines to form two harmless products, nitrogen and chloride ion. 1. ASTM International standards of activated carbon committee test methods: D 2862 Test Methof for Particle Size Distribution of Granular Activated Carbon; D 5742 Test method for Determination of Butane Activity of Activated Carbon; D 5228 Test Method for Determination of Butane Working Capacity of AC; D 3467 Test method for Carbon Tetrachloride Activity of Activated Carbon; D 2854 Test method for Apparent Density of Activated Carbon; D 2867 Test methods for Moisture in Activated Carbons; D 4607 Test method for Iodine Number; D 5832 Test method for Volatile Matter and D 5919 Practice for De- termination of Adsorptive Capacity of Activated Carbon by a Micro-Isotherm Technique for Adsorbates at ppb Concentrations. 2. Software for ASTM test methods: Aqueous- and Vapor-Phase Carbon Adsorption Software; VOC Vapor-Phase Carbon Adsorption with Relative Humidity; Isotherm Analysis; Compound Database; ASTM Particle Sizing Analysis and Refractive Index Estimator. 3. A.D. McNaught and A. Wilkenson, AIUPAC Compendium of Chemical Technology, 2nd Edition, Blackwell Scientific Publications, Oxford (1977). 4. F. London, Z. Phys Chem B11, 222 (1930). versity Press, Princeton, NJ (1945). Henry Nowicki, PhD/MBA, is PACS Activated Carbon Services Inc. President and Senior Scientist. He has been awarded nine government SBIR contracts for R&D on new activated carbon products. Nowicki provides the introductory course for PACS Activated Carbon School, has been an expert witness for environmental, safety and activated carbon cases and is technical chairperson for the bi-annual Interna- tional Activated Carbon Conference and Courses program. He may be reached at (724) 457-6576 or Henry@pacslabs.com. Wayne Schuliger, PE, is a PACS technical consultant and teaches Design, Operation, and Troubleshooting AC Adsorber Systems for Water and Air. George Nowicki, BS, directs the PACS day-to-day laboratory services for the AC industry. Barbara Sherman is a laboratory technician and directs PACS short courses and carbon conference registrations. She can be reached at Barb@pacslabs.com or phone (724) 457-6576. PACS Activated Carbon Services Inc. provides laboratory routine and advanced testing, consulting and training courses and sponsors the bi- annual International Activated Carbon Conference and Activated Carbon School. The company provides one-stop shopping for activated carbon testing, consulting and training services. The next carbon conferences are September 18-19 in Pittsburgh, PA and Orlando, FL February 25- 26, 2016. Information is at www.pacslabs.com or call (724) 457-6576.